With little effort on our part, we acquired many more pumpkins this year than the two I had planned on for the kids. Our neighbor gave us four that had volunteered in her yard and a couple from church gave us a big one along with a bunch of gourds to make what they call a "jolly goblin." Thus instead of two, we have seven pumpkins. Yesterday it was clearly time to do a little pumpkin "harving" as my son used to call it. The Boy wanted a vampire, The Middle Girl wanted a kitty cat, The Baby wanted to eat the pumpkin guts and we carved another one just for good measure -- as well as making the Jolly Goblin. And by the time it was all over, we had so many pumpkin guts and seeds and I was so tired that I didn't feel like roasting anything. 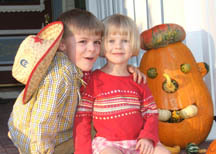 But we got some cute jack o'lanterns and still have a couple of uncarved pumpkins. Maybe I'll gut one of those later for the seeds. Without further ado, we have the whole family of pumpkins. Wow! Those are great! I feel like such a slacker now. Nice! I like the goblin. I love carving pumpkins, but I never thought of adding bits to the pumpkin. Those are great, especially the cowboy hugging his li'l sister. She's not much bigger than the pumpkin.